When setting a summer table some of my criteria are color, lots of color, and fun graphic prints. 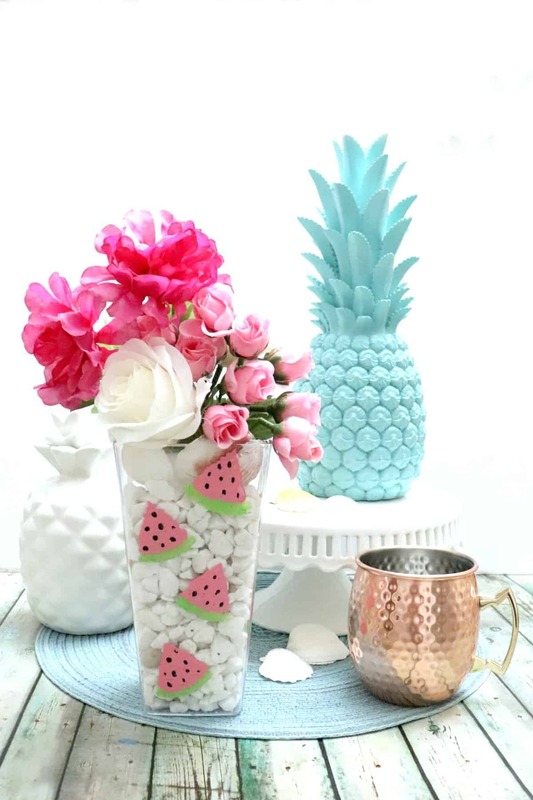 I had this in mind when I created a pretty watermelon vase for this month’s Dollar Store challenge. I grabbed a plastic vase from my favorite Dollar Tree and used a simple sponge painting technique to create something colorful and graphic for a summer table. Dollar Tree is a great spot for simple vases and containers, this one is squared off on the edges and can hold flowers, a candle or ever silverware. I chose to paint the outside so I can fill the vase with water and real flowers if I choose. I wanted a uniform watermelon print on this vase so I chose to make my own stamp using a kitchen sponge. 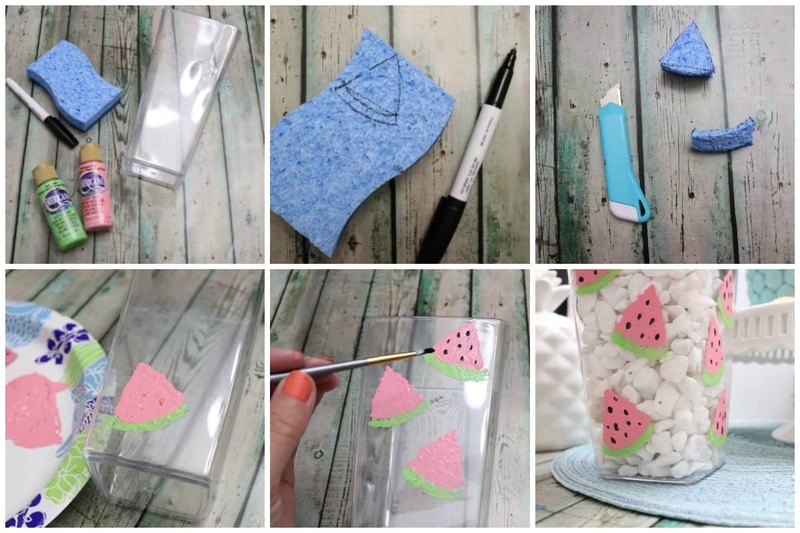 I drew a watermelon slice on the sponge then cut it out into 2 pieces using a craft knife. The back of my sponge had a scrubby surface so I used a scissors to cut all the way through. I used a paper plate to lay out my colors and began to sponge paint. I dipped the triangle part of the watermelon into pink paint then dabbed off most of the excess. Gently pressing it on the vase I made sure the paint didn’t spread too much. Then I went back with the small rind and green paint, finally adding black seeds with a fine point paint brush. I sponged 4 watermelon slices on each side of the vase so it has a uniform look all around. For this summer table I filled the vase with white stones and pink flowers that I had left over from another dollar store project. 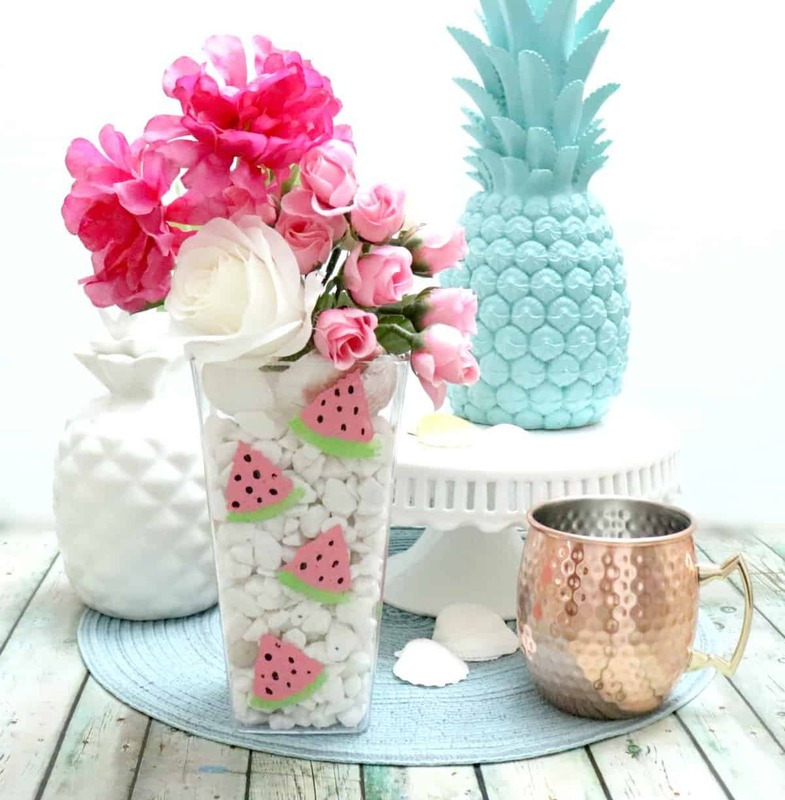 This summary watermelon vase makes a beautiful centerpiece inside or on an outdoor display table. My friends are sharing some fun in the sun dollar store projects today as well. Check them out and be inspired to create something today. That’s about how my daughter reacted when I made this one, she wants to stamp all the things! Thanks Heather.